The dodo is the most famous of all creatures to have become extinct. But how much do we really know about it? The skull you see here is one of the Museum’s greatest treasures. As the only example of dodo soft tissue left in the whole world, the Oxford dodo is invaluable to scientists. Its scientific name is Raphus cucullatus and it belonged to the same family of birds as pigeons. It is believed that this flightless bird lived solely on the island of Mauritius in the Indian Ocean, in the woods in the drier coastal areas, where it ate fruit. Subfossil remains show that the dodo would have been 1m tall and may have weighed 10.6–21.1 kg. However, drawings, paintings and written accounts from the 17th century vary so greatly that its exact appearance is still unknown. The first mention of a dodo was by sailors in 1598 and its last accepted sighting was in 1662. During this time, it is believed that it was hunted by sailors, their animals and invasive species introduced to the island, which led to its extinction. Sir John Tenniel (1820–1914) was an English illustrator. One of his major accomplishments was illustrating Lewis Carroll’s Alice's Adventures in Wonderland in 1865. His drawings have become one of the most iconic representations of the dodo. This everyday phrase highlights how the dodo has become a fixture in popular culture. 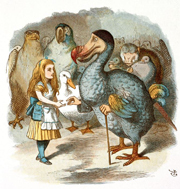 Since its famous role in Alice in Wonderland, the dodo is seen as a symbol of extinction and obsolescence.